This story first appeared in Gold & Treasure Hunter Magazine May/Jun, 1997 on Page 16. This issue is still available! Click here..
Larry Ogborn was not born a gold miner, but a number of years ago he visited Happy Camp for the first time and fell in love with gold mining. He bought a 5-inch dredge; and during the summers while his son was visiting, they would dredge for gold together. Soon, however, Larry was extending his dredging time beyond the limits of his son’s visit. And, in time, the five-inch dredge just wasn’t large enough to satisfy Larry. So he bought a 6-inch dredge and invested a great deal of time into customizing it. Once Larry’s 6-inch dredge was completed, he was very proud of it. Larry joined The New 49’ers to gain access to more mining property than he could prospect in a lifetime, and soon became a lot more serious about mining gold. By this time, Larry had moved to Happy Camp, bought a home, and had been living there for several years. He bought two dogs to keep him company, and all was right with his world. Larry was finding one to two ounces of gold every single day. You just don’t walk away from that if you can help it. Larry derived great satisfaction from his dredging; and in time he added to his equipment. 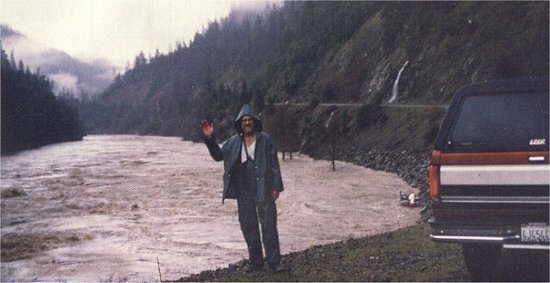 Since many of dredging sites Larry preferred were in deep canyons along the Klamath River, he mounted a winch on a separate floating platform, and also purchased a jet boat so he could gain better access to the more remote locations. In the fall of 1996, Larry was working on a rich claim in the canyon below Independence Creek, approximately 20 miles downriver from Happy Camp. He was just about to run out of one pay-streak when he discovered an even richer one just upstream. It was fall by this time, and almost all the other New 49’ers had quit dredging for the season. It was cold! But, Larry was finding one-to-two ounces of beautiful gold every single day. You just don’t walk away from that if you can help it! So Larry devoted another two weeks working the pay-streak with really good results. He was recovering a lot of gold! Thanksgiving came and went; and with it, the first heavy rain of the winter wet season in Northern California. Soon, the water was so swift, that Larry was unable to dredge in his pay-streak. So he moved his prized dredge downriver to calmer waters and did some sampling in that area to see if he could pick up an extension of the same pay-streak. It was something productive to do just until the rains let up enough so he could get back into that original pay-streak in the swifter water further upstream. Larry continued sampling in areas that he could get to without endangering his dredge, but rising water levels in the river due to persistent rains were making it increasingly difficult to find a place to dredge. The rains grew heavier, and the water became muddy and extremely fast. Soon, Larry was spending a lot of time making trips downriver to check on the condition of his dredge and boat in the increasingly-bad weather. Up until the week before Christmas, Larry was still able to negotiate his boat over to the dredge, which was tied off on the far bank of the river. But that week, the river grew too dangerous for any further boat trips. He had the dredge riding in a very good spot, it was tied well, and there should have been no further problems with it. For years, Larry and many other dredgers in this area have left dredges in the river (including the canyons) during the winter months, and there had never been problems before. Leaving dredges in over the winter, mining could be done when weather allowed, giving a break to cabin fever. In this canyon, the only way to get any dredge out was to float it over to the highway side and hire a crane to winch it up the mountainside and out of the canyon. This would be an expensive exercise, if not necessary. Once the river becomes so treacherous, it is impossible to safely cross it with a dredge. Larry’s jet boat was tied off on the roadside bank where there were many large rocks. It took a pretty constant watch of the river and its level to keep the boat off the rocks. Rising water meant Larry had to keep adjusting ropes and using different tie-offs along the side of the river. Larry had attached tires to the side of the boat that was against the rocks, to help keep the aluminum sides from getting all banged up. But it was a treacherous bank for a boat. As the rains increased, water had to be bailed out of the boat to keep it from being swamped and overwhelmed by the river. As rains steadily grew longer and harder, Larry spent most of his time every day of the last week of the year running upriver and down, checking on the boat at least four times a day. It was continuously necessary to shorten the ropes as the water climbed, and adjust them to keep the boat off the rocks. Soon, bailing water from the boat several times a day was not enough. On Monday, December 29th, as the rains increased in intensity, the river grew wilder than Larry had ever seen it. Tremendous waves roared through the canyon, churning masses of water, mud and violent whirlpools which were washing right past the boat. It made Larry dizzy to watch down on the river. Entire trees were washing by! He knew then that the situation had become critical, and the only way he would be able to save the dredge and boat would be to camp down there in his truck so he could do whatever was necessary as river conditions continued to worsen. So Larry made a quick trip back up the canyon to town, picked up his two dogs, some food for them, sandwich-makings, coffee and some snacks. He took enough for a couple of days, worried that the river could take some time to drop back down to normal winter flows. Then he rushed back downriver. The rain was still coming down in sheets, and he was concerned about the two hours that he had been gone. Larry invested the remainder of that day making the journey down the bank every hour and a half, bailing out the rainwater that was rapidly filling his boat. He had to adjust the tie-off lines every time to compensate for rapidly rising water. Larry found it necessary to use seven different tie-off lines to keep turbid river currents from smashing his boat on the rocks. As it grew dark, he parked his truck so that the headlights were shining on the trail that led down to the boat. Larry continued his vigil all throughout the night. He would turn on the lights every hour and a half, lock the dogs in the truck and follow the trail down to the river. As the truck was parked some distance away, Larry used a small flashlight to guide himself down the treacherous, slippery mountainside in the dark. Down on the river, the boat was pitching two feet or more with each wave. With only the small flashlight to help him see, Larry had to negotiate his way onto the boat from the slippery bank, bailout the water as rapidly as possible, adjust all of the ropes, check to make sure his tires were still in place along the side to buffer against the rocks, and then fight his way to the shore and back up the mountainside in the driving rain. There wasn’t anything Larry could do about his dredge which was tied off on the far side of the river. Larry had had no sleep when Tuesday morning dawned, but his dredge was still riding the water well, and the boat was still floating. He kept to his schedule. At in mid-morning, another miner arrived on the scene who also had a large dredge on the opposite bank of the river. This other dredge was in trouble. When Larry first saw the other miner, the guy was already launching a raft into the turbulent canyon and was preparing to attempt a crossing to the other side. Larry was stunned that anyone would attempt to cross the incredibly turbulent river in anything! But even before Larry could go talk to the guy, the other miner climbed into the raft on his belly, pushed out into the river and started using his hands to try and paddle himself across. This had worked for the man in calmer water, but Larry was convinced that nobody could paddle a raft across the Klamath River under those conditions. This particular miner had not been dredging very often during the winter. He had a firewood business in town. The late fall and early winter months found him busy cutting, splitting and delivering wood to the residents of Happy Camp. That work, strengthening his arms, probably saved his life this day; because the raft, when it reached the tremendous waves out in the swift current away from the bank, immediately capsized and the man was tossed out into the raging river. And the guy wasn’t even wearing a life preserver! Even though the miner was a large man in good physical condition, he still had a formidable task to ford that river in a narrow canyon, with raging 40-degree water roaring through at breakneck speed. As Larry watched, with tremendous power born out of fear for his life, the man swam for the opposite bank. Even in the violent storm-tossed river, the man actually made it to the other side, pulling himself up onto the rocks to rest near his dredge. There, the man quickly secured his dredge where it would be safer. Then he hiked up over the mountain and followed Independence Creek down the other side, so he could cross the Klamath River over the Independence Bridge. One swim across that river was enough! A passerby immediately called 911when the man first capsized into the river. As is the way with small towns, not only did the local sheriff’s deputies and ambulance respond, but a goodly number of others in the mining community also showed up to help wherever needed. Many residents in Happy Camp keep a scanner on at all times to remain informed, and to be able to provide assistance to others when needed. So it was only a matter of minutes from the 911 call before a bunch of New 49’er members and others were on their way down there to provide assistance. Then Dave captured the river conditions which the man actually swam across. Isn’t it a miracle that that the guy actually survived it? Late Tuesday afternoon, Connie and Dave Rasmussen, residents of the only nearby home, stopped by to tell Larry that a big slide had closed Highway 96 between there and town. Larry did not say much. He was feeling pretty depressed by this time. His large floating winch platform had been dragged away by the storm that morning. Now with the news of being cut off from town, it looked like he was going to go hungry, too. Larry was just about out of the food he had brought down there with him. His dogs were also hungry. He had not planned on being there for so long. But the rain was increasing in intensity; it was not letting up! He had had no sleep, little food, and things were not going well at all. Larry thanked the Rasmussens for the information and got back into the truck to rest. At least he had the dogs for company. Larry was worried about friends in town who lived along the river and creeks. He was wondering just how bad it was back there. What he was seeing here was unbelievable! Just as Larry was sinking into a pit of depression, a truck appeared. It was the Rasmussens again, and he couldn’t believe his eyes! They had a tray that held a big bowl of steaming hot, home-made stew, fresh-hot homemade biscuits, a soda, and some candy for dessert. They even brought dog food for his dogs! He just couldn’t believe it. They were so supportive, it really cheered him up. After he ate a hot meal, Larry’s faith was restored that things might work out all right after all. Larry maintained his vigil throughout the night again, going down every hour and a half as the water continued to rise and grow evermore turbulent. It was becoming very difficult to get onto the boat. When Wednesday (New Year’s Day) came, the river was the worst he had ever seen it. Down in the boat, Larry found that he could not look out onto the raging river without becoming so disoriented that he could no longer keep his balance as he tried to board the boat. Larry spent New Year’s Day watching all the trees and people’s belongings pass by on their headlong rush for the sea. He saw several dredges pass by, along with many bits and pieces of other manmade things. Larry could not imagine what things looked like upriver, given the tremendous amount of personal belongings that were washing past him downriver. That night, as it grew dark again, and the waters became even more turbulent, Larry watched the boat rising and falling violently on the waves, and he decided that he simply could not attempt the trip in the dark again that night. He had less than three hours sleep since Sunday night, he was numb to the bone with cold, and he was totally exhausted. So Larry climbed into the truck with his dogs and quickly fell asleep. Six hours later, Larry woke up to the early hours of the 2nd of January. With dread in his heart, he shined a flood beam down where the boat was supposed to be, and it was actually still there! The seven lines that he had tied to the boat were not in the best of shape, but the boat was still there and in one piece. Larry tried to see if his dredge was still across the river, and thought he could see the blue of the canopy, but decided it was just his own wishful thinking. When Larry woke up, it took him 20 minutes to get up the nerve to get out of the truck and look to see if his dredge and boat were still there. Overnight, the boat had risen to within 10 feet from the final mooring spot where he had left it on the previous day. There was nowhere higher up that the boat could be tied off to a firm anchor. What would he do if the water continued to rise? Larry felt numb by this worry, and he just couldn’t think anymore. Finally, he climbed back into the truck and slept for several more hours. There was nothing more he could do. It was just beginning to get light when Larry awoke again. It took him 20 minutes or more to get up the nerve to go over to check on the boat and dredge. He was so afraid they would be gone that he could hardly look. What a great surprise when he found that the water had already dropped quite a bit, and both the dredge and boat still there! Larry rushed down to bail the boat and give slack on the tie-off lines. Two of the ropes had been secured to the windshield frame, and the frame had been ripped out completely by the heavy pulling of the storm. Luckily, he had also secured the ends of both lines to the side rails of the boat. If not for just that little extra security, Larry would certainly have lost the boat. From then on, it was just a matter of adjusting the ropes to keep it off the rocks as the water rapidly receded. Friday, the Rasmussens had arranged with friends to meet them at Rattlesnake Rapids, and walked across the slide-area where they were picked up. They then rode into town to pick up supplies for themselves and for Larry. Leroy Hardenburger arrived with more food and supplies for Larry on Friday, as did other New 49’er members, Gary Wright and Bill Seifert. The river had receded from the road by this time. They brought news of everyone in town, and Larry was happy to learn that everyone was okay, although some had sustained heavy property damage from the flood. How great it was to have good friends. And the Rasmussens; they were not gold miners and he had hardly even known them before the storm. They provided continual moral support for Larry and all his necessities.